Glasgow’s award-winning International Financial Services District (IFSD) has attracted over £1bn of investment to date via global companies like Aon, Aviva, Barclays, BNP Paribas, esure, HSBC, JP Morgan, Morgan Stanley, National Australia Group, Santander and Tesco, creating 15,500 new jobs since 2001. New occupiers, one million square feet of new office space, the Tradeston ‘Squiggly’ bridge and exciting leisure plans for Broomielaw Quay, all add fresh impetus. This sector is thriving at Pacific Quay and is now marketed as Creative Clyde. STV and BBC Scotland are firmly established here in high-tech broadcasting centres and 50 more creative SMEs have set up in Medius, The Hub and Film City Glasgow. A Floating Village is planned for the Canting Basin and, opposite, the 12,000-seat Scottish Hydro Arena opens in 2013, reinforcing the area’s credentials as a world class entertainment and conferencing venue. The 4,000-strong, highly skilled workforce at BAE Systems Govan and Scotstoun shipyards are busy completing six Type 45 Destroyers and building key sections of the two 65,000 tonne Queen Elizabeth Class Aircraft Carriers for the British Royal Navy. The £842m redevelopment of the NHS Southern General has expanded its maternity hospital, opened a huge laboratory, and is building two new hospitals, creating Europe’s largest medical campus, employing thousands and able to treat 725,000 patients per annum. 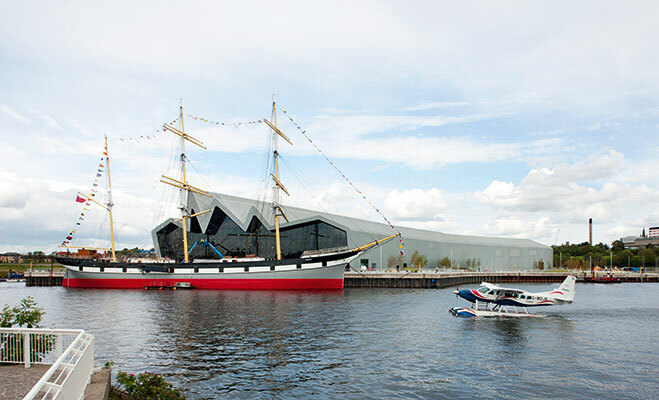 The £74m Riverside Museum, designed by Zaha Hadid, has attracted one and a half million visitors since opening in June 2011, complementing other major Clyde attractions such as the Glasgow Science Centre, the Glenlee Tall Ship, Xscape and the Titan Crane. Braehead near Renfrew, already Scotland’s busiest shopping centre, is due a £150m expansion and Glasgow’s Style Mile (Buchanan Galleries/Street and Argyle Street/St Enoch’s Centre) is one of the UK’s most popular shopping destinations. Over 9,000 new homes have been built since 2003 along the Clyde, such as the award-winning £1.2bn Glasgow Harbour development which has further shops, restaurants and hotels planned. At Ferry Village near Braehead, six developers are building a range of 2,000 apartments and detached homes by Clyde View Park. Clyde Waterfront’s online resource offers teachers 200 free lesson plans that link 12 themes of the Clyde with the eight main subjects of Scotland’s Curriculum for Excellence. Schools can reinforce this learning via Clyde Marine Services’ ‘Classroom on the Clyde’ river trips. Clyde Waterfront has produced 250,000 Heritage Guides, as well as bespoke Clyde advertising, to attract visitors to the area. Clyde Cruises and Clyde Link ferries are using newly installed public pontoons, complementing other river operators like Seaforce, Loch Lomond Seaplanes and The Waverley Paddle Steamer. Its skilled workforce, cost competitiveness, excellent communications and new infrastructure have given Clyde Waterfront a real momentum. However, there are another £2bn of identified commercial, retail and residential opportunities for developers, investors and companies to realise.